When DmC Devil May Cry was first announced in TGS 2010, long time fans of the series shunned Dante’s new look. Now that the game’s released, did Capcom’s decision to give the reigns of the series to Ninja Theory pay off? I must admit that my time with the Devil May Cry series hasn’t been good as of late. While I thoroughly enjoyed and praised the first Devil May Cry, I didn’t really like how easy Devil May Cry 2 was. I certainly didn’t appreciate the dramatic difficulty spike in Devil May Cry 3, though I’ve warmed up to how incredibly rewarding that can be. Having to play as Nero in Devil May Cry 4 didn’t make matters any better and it was then that I felt that Capcom was desperate in trying to revive interest back into the franchise. From that point on, it was very difficult to see what direction Devil May Cry was going. So when Capcom announced that the series was getting a reboot of sorts thanks to Ninja Theory, you can bet that I was pessimistic. 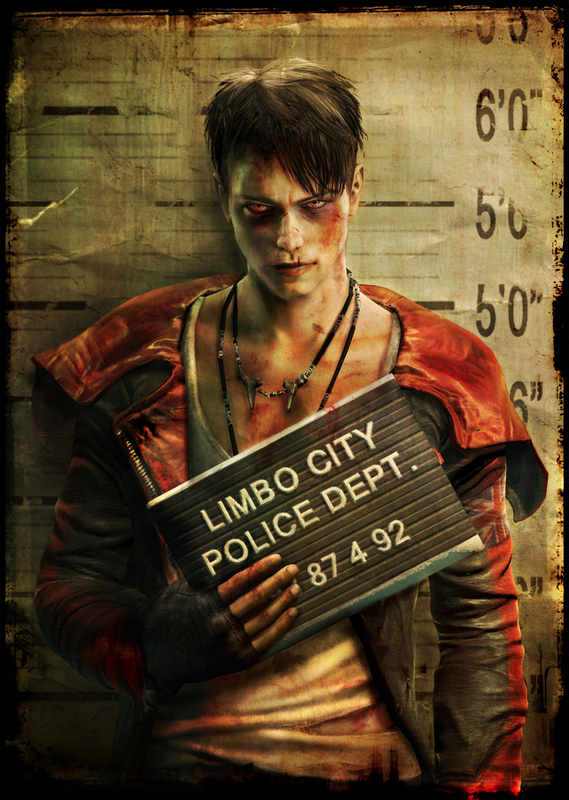 It didn’t make things any better when the very first promo art that Capcom released was a police photo of Dante, who seems to have been beat up, holding his nameplate. I groaned at the idea that Capcom was trying to make the series a bit edgier, maybe even forgetting what made the Devil May Cry series so much fun. I also started to question the direction that Ninja Theory wanted to take the series in. While I’ll admit that both Heavenly Sword and Enslaved: Odyssey to the West didn’t interest me from a gameplay perspective, Ninja Theory definitely knows how to tell a good story. Fast forward to January 2013 and I find myself with a copy of DmC Devil May Cry that I have to review. But something is different about this Dante, other than the obvious. In fact, it seems that from the very moment I started playing as this brash, arrogant, “sexual deviant” Dante, up to the point that I learned much of his past, I realized that his quest for identity almost parallels the fan reaction to this game. This Dante’s a guy who has been tormented his entire life by demons and a past he doesn’t even remember. The past then comes crashing down on him thanks to an attack orchestrated by a demon god named Mundus. The Order, an organization dedicated to revealing Mundus’ plot, finds Dante just in the nick of time and manage to whisk him away during the attack. It’s in The Order’s base that it’s revealed that not only is Mundus enslaving all of humanity, but he also killed Dante’s mother and enslaved his father for all of eternity. 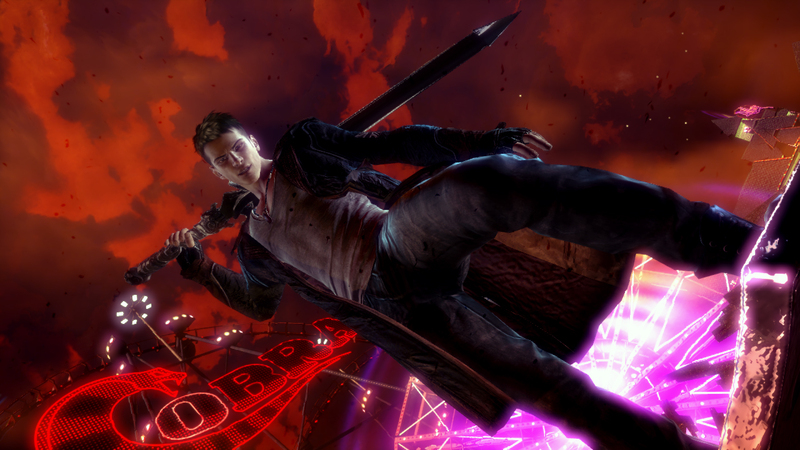 The original Devil May Cry introduced a brand new style of gameplay that simply was not present in action games at the time. Capcom dubbed this new genre, “Stylish Hard Action,” meaning there would be lots of action, style, and it’d take some effort to pull things off because the game would be difficult. 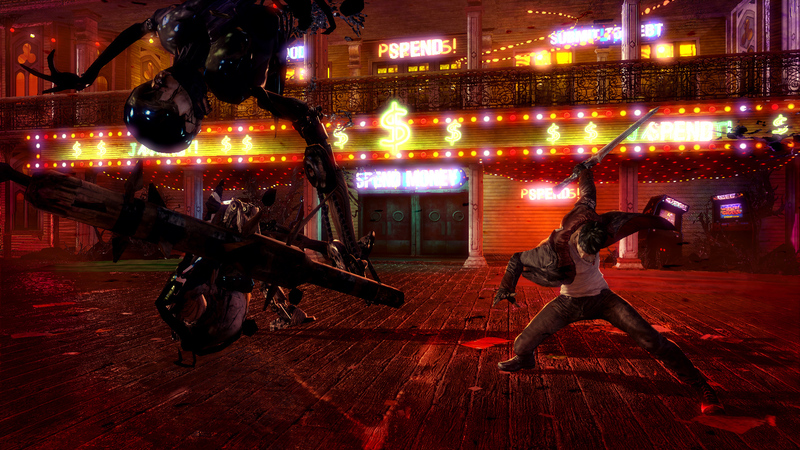 DmC Devil May Cry delivers an impressive array of weapon options to the player. By default, you start off with Rebellion, Dante’s sword, and his twin pistols, Ebony and Ivory. You unlock additional weapons by progressing through the missions in the game. Some of these weapons have Angel or Demon affinities, designated by a blue or red glow when you equip them, and switching to these weapons is as simple as holding either the Left or Right trigger. You will also unlock the ability to utilize your Devil Trigger later in the game, which is an ability that you can use after defeating a certain amount of demons. This ability will grant you increased damage and toss all your opponents in the air like sitting ducks so you can chain combos on them while regaining a little bit of health in the process. Later in the game, you’ll be given an additional weapon for each affinity and a couple of new guns, totaling up to eight different weapons. The game allows you to equip one type of gun, one Angel affinity weapon, and one Devil affinity weapon. Switching equipped weapons is as simple as pressing a direction on the D-pad. Each of these weapons add an incredible amount of depth to the gameplay: Angel affinity weapons help with increasing Dante’s range both vertically and horizontally, in addition to getting in some quick hits, while the Devil affinity weapons help Dante deal significant amounts of damage up close and personal, but are slow to hit. The fact that anyone, regardless of their experience with the series, can pull off some impressive looking combos with all the weapons Dante has does not make the game any easier. You can probably get by with mashing buttons early on in the game, but you’ll quickly realize that DmC Devil May Cry‘s difficulty ramps up quick the more you obtain new weapons. After a certain point, the game will introduce enemies that can only be damaged by a specific affinity, so careful timing and strategy is involved. This is, unfortunately, where some of the kinks with the game start to reveal themselves. In previous titles, the player has the ability to lock onto a specific enemy. This allows the player to focus all of their attacks to that enemy. DmC Devil May Cry tries to guess what enemy you’re targeting based off of the direction you press the Left Stick and, for the most part, succeeds. The problem is when situations like affinity demons come up where they are mixed in with a demon of the opposite affinity, in addition to a bunch of other demons that can quickly overwhelm you. This can be quite meddlesome when all you’re trying to do is stun a particular set of enemies, only to have the game think that you were aiming for a demon who can reflect the attack back at you, causing you to be stunned in the process. Thankfully, the game also gives you a couple of grappling hook type moves to mitigate the issue with the smart lock on. While not a real substitute for a lock on feature, being able to pull an opponent towards you or being able to pull yourself towards your opponent increases Dante’s ability to do crowd control as well as increase his ability to move around the area. 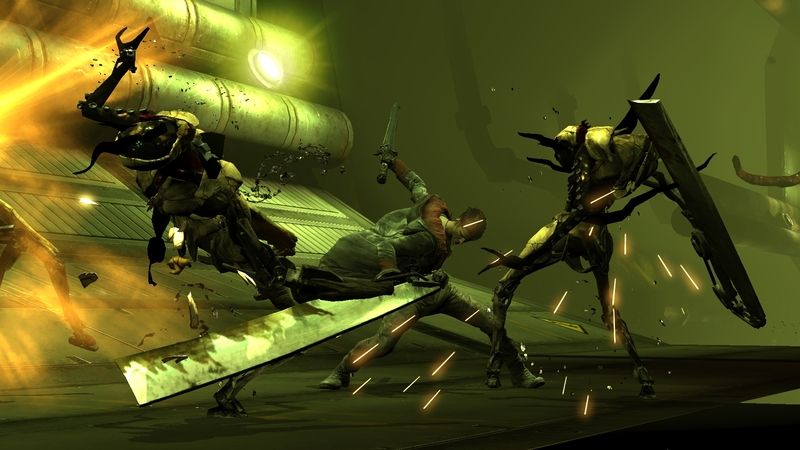 Because of this increased mobility, some missions are peppered with mild platforming sections that serve to break up the game into interesting set pieces. Surprisingly enough, you are not given a single moment where you have to do a quick time event. You will always use something from Dante’s move set in order to trigger big moments in the game. The combo rating system that has been a part of the series since the beginning also returns in this reboot, albeit a bit modified. You don’t have to quickly figure out what opponent to take on next, hoping that you get at least a hit in to ensure that your combo keeps going. In fact, there were several times that I decided against this, instead surveying my surroundings and then proceeding to decimate another group of monsters. Another change is that when Dante gets hit, your rating drops a couple of grades down instead of just outright ending it, so dodging becomes a very crucial part of the game. Later on, you will also be required to change affinities as the floor might harm you should you have the wrong affinity activated, thus temporarily limiting your options. Like with most action games in this genre, you can also upgrade your move set by purchasing upgrades for either your abilities or your weapons at stores scattered across missions or in-between missions. DmC Devil May Cry doesn’t require you to spend red orbs to buy upgrades and you’re given white orbs to use as upgrade points. You can always re-spec your spent upgrade points at any time you’re at a shop, so you’re not stuck with a configuration forever. You can also purchase items that will extend your health bar, recover your health, or revive you when you’ve been killed. Having played the game at Devil Hunter, I will recommend that experienced Devil May Cry players start the game at Nephilim difficulty setting. While some may complain that harder difficulty settings are locked at the beginning, the lock out is one of necessity. As mentioned earlier, certain demons that can only be defeated by using a weapon with certain affinity, rendering other types of attacks useless. 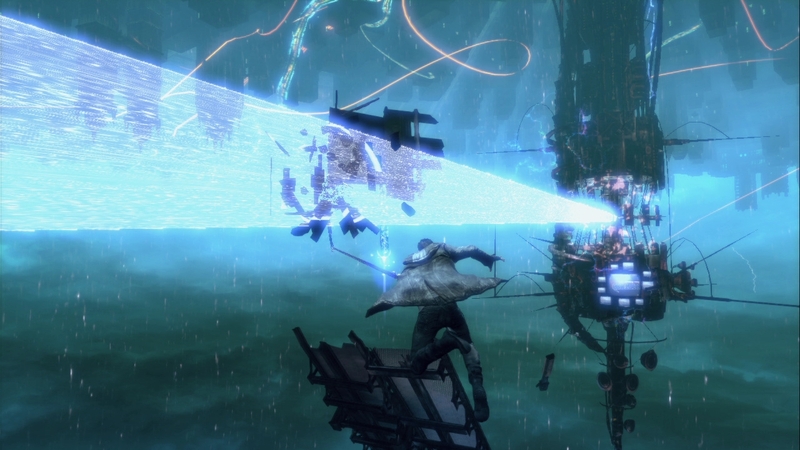 As such, the game requires at least one playthrough in order to be able to participate in more challenging difficulty modes. Upon completing the game, you’re able to carry over all the weapons, upgrades, and items you’ve got remaining to your next playthrough. 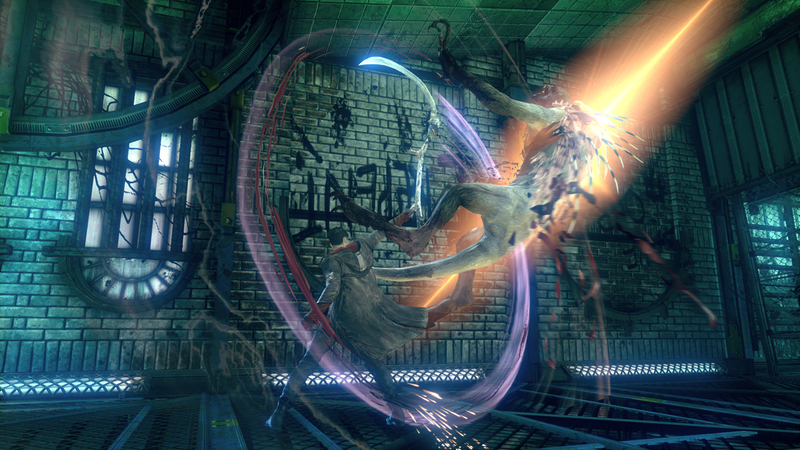 Each difficulty setting adds something new to the formula: Not only are the enemy waves remixed, but enemies also get extra moves and attack patterns, ensuring that your next playthrough delivers more challenges and forces you to really learn the nuances of Dante’s different attacks. For instance, when I started playing the game on Son of Sparda difficulty after my initial playthrough, I was already facing enemies that showed up in the later missions during the very first mission of the game, complete with more aggressive attack patterns and the like. But unlike the later games in the series, any sort of success or failure on my part to survive an enemy encounter is something that I finally felt in control of. I was never put in a position in the game where I proclaimed that the game cheaped me to death by not allowing me to see what I or my opponents were doing. DmC Devil May Cry features a responsive and snappy camera that allows me to be able to frame my enemies and be able to properly figure out my plan of attack. 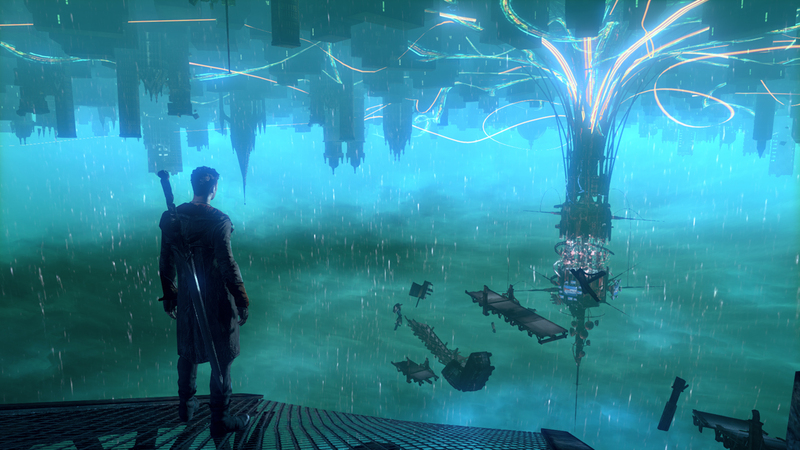 Dante’s world is rendered in painstaking detail thanks to the artists at Ninja Theory, who seem to have made absolutely sure that we’re to forget that this game is powered by the Unreal engine, an engine that primarily powers shooters. When trapped in Limbo, the real world melts into one that’s filled with subliminal advertising – literally, the truth hidden in a web of lies. From time to time, you’ll see words streak across the screen, reflecting the hive minded demons’ focus to destroy Dante or even display labels for items the demons would use to control the human population in general. Some people may find this heavy handed and even pseudo-conspiratorial or political, but I felt that the extremity that the developers went to depict this helped add to Limbo’s otherworldliness. There’s an incredible sense of place in both the real world and limbo, and the level designs are some of the most creative and detailed I’ve seen in a long time in this generation. This would have been enough, but Ninja Theory has a knack for using their levels to tell stories and this is in full effect here. A good example would be one that happens in an early cinematic where Dante and the leader of The Order are walking through an abandoned playground and the graffiti on the walls reflect the backstory that’s being talked about. Yes, this sounds all too pedestrian, but I dare you to find a game that executes this in a better fashion. The aggrotech stylings of Combichrist, mixed in conjunction with the electronic drum and bass stylings of Noisia, complement the visuals perfectly. It also helps that every sword swing, gun shot, grunt, and scream all work together to create a visceral action experience. And I actually felt that the voice acting for all the characters were top notch. I looked forward to every single scene where I was introduced to either a new character or just to watch a sequence where various characters were interacting with each other in service of advancing the story. Simply put: Everything you see, hear, and feel work in concert with each other to further bury you into the game’s world. To prepare for this review and to reacquaint with current stylish action game standards, Alex played through the first four chapters of Bayonetta, the first three missions of Devil May Cry 2, and the first three missions of Devil May Cry 3. Alex then completed DmC Devil May Cry on Devil Hunter difficulty, completing it at 8 hours 33 minutes and played through the first two missions on Nephilim and Son of Sparda to assess the difficulty of the game. Capcom did not provide a review copy of this game and certainly isn’t responsible for Alex repeatedly listening to Noisia and Combichrist while writing this review. + Controls are intuitive, responsive and give the player a lot of freedom to move around an area and string moves together seamlessly. + Has a snappy, responsive camera. + The Noisia / Combichrist powered soundtrack fits the tone of the game perfectly. + The level design is some of the most creative and craziest I’ve seen in this genre in a long while. -The smart lock on feature needs to be a little bit smarter.